My Wine of the Month for January is a bit of a mystery. I was offered a small taste and then selfishly poured myself a larger glass to savour. The bottle was shared courtesy of Andre, South African ex-pat medical man currently working in a London hospital. He’d brought the bottle back from his latest trip home. Andre took delight in telling me that the wine-maker 'hates' Pinotage and the property sells off all their Pinotage to other wineries. But this time they had some fruit left and decided to make a wine but they didn’t want to be it to be like the usual ones that they don’t like. I don’t know the facts and Andre may be pulling my leg, because this wine is superb. It’s definitely Pinotage —so I wonder what they’ve been judging the variety on— it's only 2013 vintage but tastes properly mature, full bodied, with elegant restrained fruit. It doesn’t have the winery’s standard label—this is plainly printed on self-adhesive paper—and the wine isn’t listed on their website but I guess it must be sold at the winery since they’ve put on the health warning. 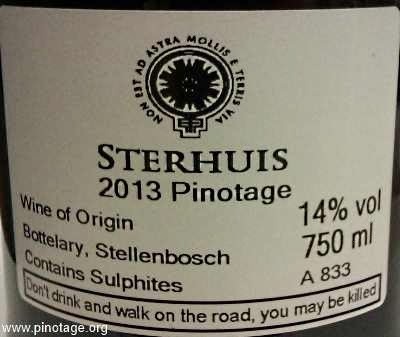 Bottelary Hills are a prime source of first rate Pinotage grapes and I’d like to enjoy more than a glass of this with dinner so I’ll try to visit Sterhuis in March to find out more about this intriguing delicious wine, and whether it has changed the mind of its maker.